If you ever needed an example to show why the recounting of rock history is a work in progress, especially in the earliest days before the genre’s boundaries were fully formed, The Ravens offer just such a case. One of the pillars of rock’s first half decade The Ravens’ importance in establishing rock’s commercial and artistic viability can not be overstated. They scored rock’s first official national chart hit with Write Me A Letter and while that would remain ostensibly their biggest record in a long career, they followed it up with ten more songs that landed on Billboard’s rather skimpy 10-15 spot R&B Charts through 1952. Their stature in rock’s vocal group realm is even more impressive than mere numbers would indicate though as it was they who set forth so many of the precedents that would shape that style over the next twenty years or more and in many ways that influence is still being felt today any time a handful of guys gather around a microphone to sing harmonies. In other words even in the hazy netherworld of early rock when almost every record and artist has been neglected in the shallow histories of the music that have existed to date The Ravens are one of the few who still get mentioned from time to time seven decades later. But while The Ravens may have been the first rock group and the among the greatest rock artists overall in the 1940’s – sorry to spoil the suspense – their destiny as to what genre they’d align themselves with was still largely up in the air for much of that time, even as they were scoring rock hits with consistency. We’ve covered the reasons behind this already, and will continue to do so over the next few years, so a full recap here won’t be necessary, but suffice it to say the reasons have to do with everybody involved trying to predict the future based largely on the past. That’s not an easy thing to do. 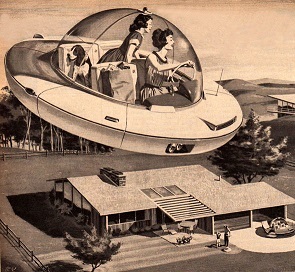 Look around the internet for images of what people of the mid-twentieth century thought the world would look like in the 21st century and then call your robot butler to open the blinds so you can look outside your window to see the flying cars for yourself to gauge their accuracy in the prediction game. In music the prognosticators in the industry were far less imaginative than that but no more accurate in their predictions. Rather than envision bold new styles meeting with mass acceptance the record companies played it safe and sought to merely tweak what had already reliably connected over the past few years. 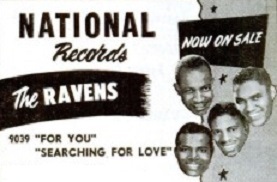 In 1947 that meant harmless smooth pop when it came to vocal groups and The Ravens, with their reliance on profundo bass voice Jimmy Ricks, were already threatening to upend the entire social order. Naturally this was seen as a risk and so The Ravens, much to our dismay, all too often stuck closer to the very musical styles their more adventurish sides were in the process of obliterating. Searching For Love is a record that attempts to find an uneasy middle ground and in the process shows why such attempts were folly. The Ravens had an advantage – if you want to call it that – for their potential to appeal to divergent markets by virtue of having two vastly different lead singers. Ricks was their centerpiece, the deepest, most resonant voice you’d ever hear and someone who set them apart from every other act in the country, regardless of what style of music you were talking about. But acting as his foil was the fragile high tenor of Maithe Marshall, sounding at times almost like a female soprano, which when contrasting with Ricks made their interplay utterly unique and memorable. But Marshall was too good to merely act as the counterpoint in the vocal arrangements, he was more than capable of handling leads which gave their records with him out front an entirely different aesthetic. A pop aesthetic. Or at least one skewing towards that field. Looking back from our perch in this century we scratch our heads at their decision to repeatedly pursue this path over the years in the face of its relative – and consistent – failure. Say what you want about its quality – and we will here in a moment – but commercially the facts are laid out pretty clearly. Their unquestioned rock sides were the ones which hit the charts, their pop offerings did not. Yet they kept at it. At this point though, just over a year into their careers and only a few months since their emergence in the new – and still untested – field of rock ‘n’ roll we can cut them a bit more slack. Though the full-throttled rocker Write Me A Letter was doing well already and would break into the Billboard listings in January 1948 and their proto-rock version of Old Man River from last summer had topped the local New York charts in Cash Box magazine, the significance of those feats as it related to signaling a marked shift in audience tastes might not have sunk in yet. So you can at least see why they were game for trying their hand at more traditional material and arrangements, the kind which had previously been a black vocal group’s only chance for receiving widespread interest. Furthermore something like Searching For Love gave Marshall, a valued member of the group who was always at risk for being obscured by Ricks on the rocking sides, a chance to step out front and strut his stuff. Should the record connect it’d only serve to expand their fan base. If it missed its mark… well, as we’ll see for a long time to come that wouldn’t stop them from trying again. There were two primary reasons we sidestepped reviewing songs like this as we started our journey through the years and only later doubled back to add them down the road. The first and most obvious reason was because they were hardly pure rock songs and thus they seemed to be an unnecessary diversion to our primary purpose here on Spontaneous Lunacy which is to tell rock’s full story, not the adjacent stories of other styles, even when performed by the same artist we were featuring. The other reason is because – in cases like The Ravens, a rock group whose own full story has to take into account these poppier diversions – grading these types of songs fairly when they were largely outside the field we were covering would prove exceedingly difficult. How do you give a high score to a record whose standards for quality vary so much from the rock sides? For example in December 1947 which we’re covering now, Winter Wonderland by Johnny Mercer was one of the most popular songs in the country. It’s a good song and they have a nice rendition with the Pied Pipers singing the familiar refrains, but if I were to include that here and judge it by rock standards it’d get a 1 and only because I don’t give out 0’s. Yet that would suggest it was an awful record, even though it isn’t. An awful record for rock ‘n’ roll, yes, but not for pop where I might give it a 6, which is better than average, using those far different standards. A little closer to home for us here would be Louis Jordan’s Ain’t Nobody Here But Us Chickens which was #1 on the Race Charts for a whopping 17 weeks in 1947 and while Jordan was the most vital precursor to rock ‘n’ roll he himself wasn’t a rocker and that song wasn’t rock either. Therefore if I was reviewing it in a rock setting I might be able to pick out a few aspects of it that are connected closely enough to get it to a 4 but I’d be pushing things if I suggested it was an average, or above average ROCK record. But in the broader all-inclusive world of black music for 1947 I’d give it a 9, which is a perfect score. So that was always an obstacle and a reason why The Ravens poppish sides were initially left on the sidelines collecting dust. Yet here we are, reviewing it anyway, and with that disclaimer out of the way to hopefully explain why Searching For Love will get the score it does here, we can talk about the actual record itself, the performances and why the song, good in a way that it is, doesn’t contribute to rock’s forward progression and therefore proved to be the wrong choice for The Ravens to release if they were going to make rock ‘n’ roll their home from now on. The basic differences in the early rock vocal approach and the existing black pop vocal group approach in this era boils down to intent. In the former, on songs like Write Me A Letter, The Ravens intent is to be suggestive. This is typically accomplished by having the songs contain a far more prominent rhythm (which of course is a bedrock of rock ‘n’ roll) and earthier lyrics delivered in a way that suggests the singer has been around the block a few times. Pop on the other hand tends to all but eliminate rhythm in favor of an emphasis on stately melodies and offers up lyrics which speak to the naïve and lovelorn from the perspective of somebody no doubt saving themselves for marriage. That’s a fairly simplistic comparison but certainly accurate. On Searching For Love Maithe Marshall embodies the virginal dreamer pretty well, delivering his thoughts without any undercurrent of impropriety. His voice takes on the characteristics of a stained glassed window – delicate and pretty, but its design and colors intentionally obscuring what’s laying on the other side. His voice is crystalline in its textures, so pure it almost seems artificial, especially when you’re coming at it from the perspective of rock where expressing the emotional ravages of love often leave the singer’s throat in tatters. Marshall though, his approach steeped in pop, sandblasts the surface and requires you to invest yourself in his technique to forge a connection. The fairly trite lyrics don’t help in that regard and without more sweat and grit in his delivery their shortcomings stand out more. Luckily he’s got the other Ravens in support and while not given much to do beyond humming unobtrusively until the very end, their wordless harmonies behind him are sublime when you focus on them. Ricks for his part gets only two brief showcases, taking the bridge and the closing in his sonorous tone which adds much needed gravity to the overall performance, but it’s still a relatively modest contribution that isn’t going to change your impression of this very much. I know there are many out there who love these kind of sides and are enraptured by Marshall’s delicate deliveries. In fact it may even be that the handful of people proudly calling themselves Ravens fans prefer the pop sides because they’re so alien to what you’ve heard in the seven decades since they came out, when more and more it was the racier uptempo romps that defined rock ‘n’ roll going forward and so these more sedate songs stand out in comparison. Okay, you’re certainly entitled to that view, but if you call yourself a rock fan keep in mind that had THIS been the song from the waning days of 1947 that became The Ravens first and biggest hit and the rock sides which achieved that status in real life had instead flopped we likely wouldn’t be here talking about either one, The Ravens as an important musical act OR rock ‘n’ roll as a transformative musical and cultural style. The reasons for this are simple. If The Ravens found success with milder material then they would’ve been quickly enveloped into the pop field, an Ink Spots for a new era leaving a gaping hole in rock’s broad scope that may never have been filled. Rock ‘n’ roll itself meanwhile would’ve faced an even steeper climb into commercial solvency without this group leading the way, scoring hits that put the industry on notice that rock music had serious potential and might be worth pursuing. As it was this record didn’t get noticed, confirming that while The Ravens might’ve made a passable pop act in theory they just weren’t going to have the impact there that ultimately they had in rock ‘n’ roll. So yes, when judged by the far different standards of already established pop sensibilities Searching For Love with its tender vocals and soothing melody may indeed fare better than the grade we’re giving it. But in the musical wilderness of late 1947 when it was kill or be killed for the many new species just coming out of their nests this type of mild offering was going to be easy prey for the more carnivorous animals that would make the rock jungle the wild party it was destined to be. Leave a reply on "The Ravens: “Searching For Love”"